In perfectly reflexive fashion, these hopes have been rewarded by rising asset prices. While still down 7% from the September highs, the S&P 500 is up 15% from the December lows. Amidst the ebullience, the VIX has fallen 39% year-to-date. We would not bet on the U.S., China and Europe comping the "globally synchronized recovery" comps. Simply put, if our forecasts are correct, the unwinding of this frenzied "buy stocks now" excitement could be nasty. While many “Macro Tourists” may still be waiting for a story like a trade war resolution to turn the market around, the cold hard data continues to show that the U.S. economy – and others globally, like China and Europe – are slowing. 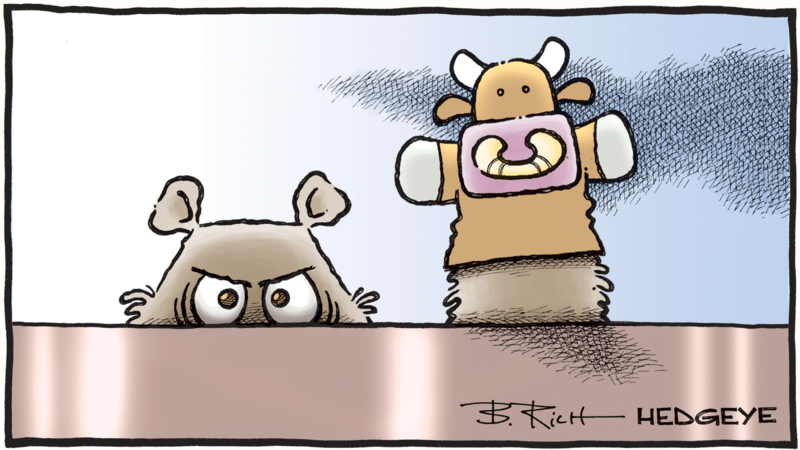 Hedgeye’s macro team has been bearish (and correct) on European equities throughout 2018, and the Euro versus the dollar since April. Both market calls were made well ahead of consensus. On a recent edition of The Macro Show, a viewer asked: Is it too late to start shorting both Europe and its major currency now that consensus seems to be catching up to our call? The U.S. economy does not need to be in recession to be on the wrong side of stocks. As Hedgeye CEO Keith McCullough explains in the clip above, while every market is different, there are some remarkable similarities in the market right now to 2000 and 2001. While the economy eventually went into a technical recession in late 2001, many investors experienced enormous drawdowns as the economy slowed over the previous year. “[In 2000-2001] when GDP stopped accelerating, you could have lost almost half your money,” McCullough explains.